A new edition of a Barefoot bestseller with sales to date of over 22,000 copies. Traverse the high seas with a lively band of buccaneers as they enjoy a melodic adventure aboard their galleon. 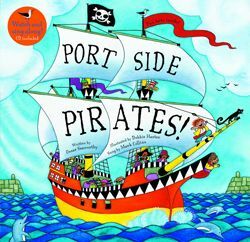 Includes fun information about historical pirates, pirates around the world, and even a helpful chart naming the parts of a ship. Also includes a dual-purpose audio and video CD to listen to the singalong on a CD player or listen and watch the video animation on a Mac or PC.